The Blur/Sharpen tool uses the current brush to locally blur or sharpen your image. Blurring with it can be useful if some element of your image stands out too much, and you would like to soften it. If you want to blur a whole layer, or a large part of one, you will probably be better off using one of the Blur Filters. The direction of a brushstroke has no effect: if you want directional blurring, use the Smudge tool. In “Sharpen” mode, the tool works by increasing the contrast where the brush is applied. A little bit of this may be useful, but over-application will produce noise. Some of the Enhancement Filters, particularly the Unsharp Mask, do a much cleaner job of sharpening areas of a layer. You can create a more sophisticated sharpening brush using the Clone tool. To do this, start by duplicating the layer you want to work on, and run a sharpening filter, such as Unsharp Mask, on the copy. Then activate the Clone tool, and in its Tool Options set Source to “Image source” and Alignment to “Registered”. Set the Opacity to a modest value, such as 10. Then Ctrl-click on the copy to make it the source image. If you now paint on the original layer, you will mix together, where the brush is applied, the sharpened version with the unsharpened version. Both blurring and sharpening work incrementally: moving the brush repeatedly over an area will increase the effect with each additional pass. The Rate control allows you to determine how quickly the modifications accumulate. The Opacity control, however, can be used to limit the amount of blurring that can be produced by a single brushstroke, regardless of how many passes are made with it. From the image-menu: Tools → Paint tools → Blur/Sharpen. By using the keyboard shortcut Shift+U. 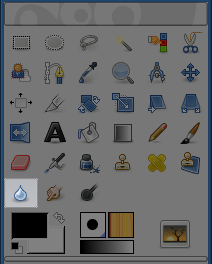 See the Paint Tools' Common Features for a description of key modifiers that have the same effect on all paint tools. Holding down the Ctrl key toggles between Blur and Sharpen modes; it reverses the setting shown in the Tool Options. Blur mode causes each pixel affected by the brush to be blended with neighboring pixels, thereby increasing the similarity of pixels inside the brushstroke area. Sharpen mode causes each pixel to become more different from its neighbors than it previously was: it increases contrast inside the brushstroke area. Too much Sharpen ends in an ugly flocculation aspect. Whatever setting you choose here, you can reverse it on-the-fly by holding down the Ctrl key. “Convolve” refers to a mathematical method using matrices. The Rate slider sets the strength of the Blur/Sharpen effect.